Maintenance of a high-diversity seaweed assemblage in the face of environmental and biological disturbance. The number and variety of species on this planet is staggering; even more so is their organization into distinct communities and ecosystems. What do we need to know to predict how communities are assembled from a common species pool? I am exploring how phylogenetic and functional diversity contribute to species coexistence in the rocky intertidal macroalgal (seaweed) community, and how they shape community responses to dynamic ecological disturbances and environmental processes. To understand how communities are structured among and within discrete environmental zones, I am evaluating fine-scale habitat and environmental parameters along a strong natural environmental gradient, the rocky intertidal ecosystem, at Tatoosh Island in the northeast Pacific. I am also clearing new habitat in the intertidal zone to mimic disturbance events and observe community succession and habitat recolonization under differential herbivory pressure along the gradient. I am creating a phylogeny of the local macroalgal community and measuring key macroalgal functional traits to understand the role of diversity in the maintenance of this high-diversity macroalgal assemblage. The interaction of seaweeds with the global carbon cycle: ecosystem implications of increased atmospheric carbon. It’s well known in terrestrial ecosystems how plants acquire carbon from the atmosphere, but we know little of how seaweeds acquire carbon from the water. The ability of a photosynthetic organism to acquire carbon ties into all aspects of its life: the ability to grow and repair tissue, defend against herbivores, and reproduce, among many other traits. Carbon uptake by seaweeds has taken on greater urgency given the changes to the carbon cycle cycle and the low ocean pH values recorded in the northeast Pacific. 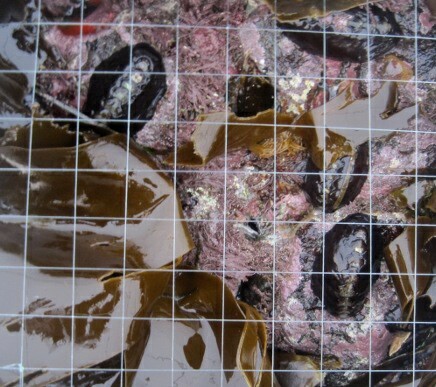 How are seaweeds interacting with the carbon cycle, how do they acquire carbon, and how might patterns of seaweed diversity change with predicted climate change? To answer these questions, I am first measuring what form of carbon different intertidal seaweeds take up and am comparing the uptake efficiency of different species. I am then applying these results to my experimental community plots (above) to understand how carbon uptake efficiency and preferred carbon form differs among and within communities and predict how seaweed diversity may change with climate change. Increased oceanic carbon reserves and availability of different carbon forms may cause some seaweed species to lose their competitive edge and favor others that were previously not competitive, altering community structure and biodiversity. 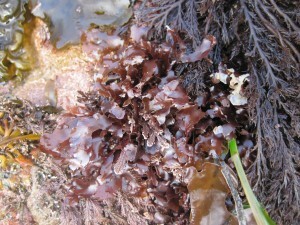 Because seaweeds serve as habitat and food resource for many organisms, changes in seaweed communities may have far-reaching effects in near-shore ecosystems. 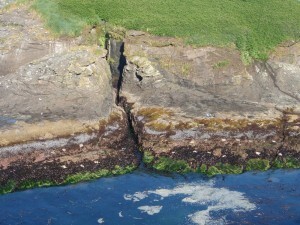 Foraging behavior of a common intertidal herbivore, Katharina tunicata. Herbivorous invertebrates (grazers) play important roles in structuring macroalgal and intertidal communities. I am interested in how they influence macroalgal community structure and mediate succession and am currently manipulating grazer densities in algal plots. Understanding grazer foraging and movement behavior is important to fully understand their interactions with macroalgae. We are tracking movement in the field at multiple sites and time scales of the most prevalent grazer on Tatoosh Island, WA, the black chiton Katharina tunicata. Population genetics of endemic Galápagos weevils and a recently introduced mainland species. Prior to starting graduate school, I worked for two years in Dr. Andrea Sequeria’s lab at Wellesley College. My research focused on the retained genetic variation and potential for demographic expansion of a recently introduced weevil species Galapaganus howdenae on the island of Santa Cruz in the Galápagos archipelago. 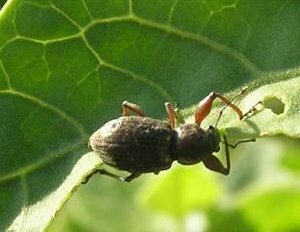 Using a microsatellite dataset, we found that the introduced weevil populations have undergone a bottleneck, but have since recovered the genetic diversity expected under equilibrium conditions. As a secondary project I focused on the comparative genetic structure and demographic history in endemic Galapaganus species and potential genetic consequences of habitat fragmentation due to goat grazing in the recent past. Analysis of mitochondrial DNA reveals a significant population structure and demographically stable populations for endemic species living in the lowlands of the Galápagos archipelago, in contrast to signals of past contractions and expansions in highland specialist species. Analysis of microsatellite markers for the endemic species is in progress. Developmental origin of shorter and longer necks in tree sloths. Dr. Emily Buchholtz of Wellesley College and I studied sloths as a possible exception to the mammalian cervical vertebral constraint. Tree sloths have a different number of cervical vertebrae than almost all other extant mammals. Only three extant genera are known to diverge from a mammalian cervical vertebral count of seven: Trichechus (manatees) and the two extant tree sloth genera Bradypus and Choloepus. We documented specimens with as little as six to as many as ten cervical vertebrae in North American museum collections. 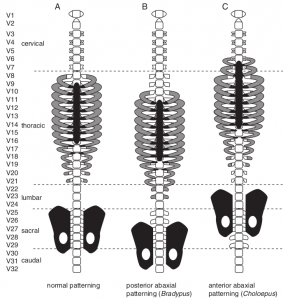 In tree sloths, it appears that the lateral (abaxial) components of the axial skeleton (distal ribs, sternum, and pelvis) develop from a different mesodermal derivative and are patterned independently of the central (primaxial) components (vertebrae and primaxial ribs). The central primaxial identity of the vertebrae does not change, but rather global homeotic repatterning of the abaxial relative to primaxial mesoderm is the origin of the unusual cervical counts. In this interpretation, the “rule of seven” in these mammals is maintained primaxially, coincident with the generation of functionally longer (Bradypus) or shorter (Choloepus) necks. I am grateful to the Makah Tribal Nation for access to Tatoosh Island and other field sites on the Olympic Peninsula in Washington State. Funding for projects at The University of Chicago has been provided by the National Science Foundation Graduate Research Fellowship Program, the University of Chicago/NIH Genetics and Regulation Training Grant, the University of Chicago Committee on Evolutionary Biology Hinds Fund, and Wellesley College Graduate Fellowships and Scholarships Program. Funding for projects at Wellesley College has been provided by the Wellesley College/Howard Hughes Post-Graduate Internship Program and the Jerome A. Schiff Fellowship.